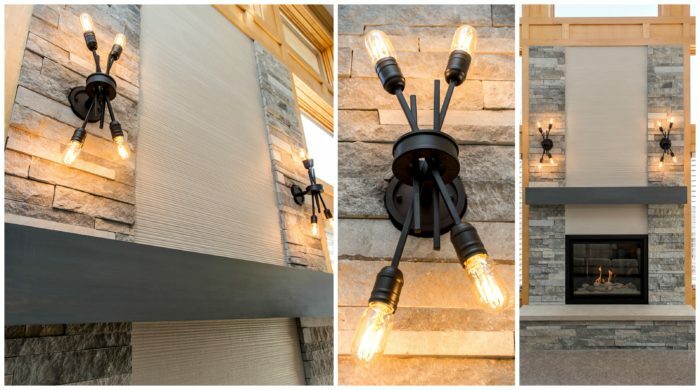 We’re kicking the year off with a review of some favorite things from projects Jenna Porter, Red House Remodeling project designer, designed for homeowners last year. She loved these and you might too. This entryway is part of an entire home remodel that took the home from traditional to transitional. Entryways are often forgotten areas of the home, but are so important because they are the first impression visitors get of the home. What I love about this area is the statement piece light fixture, the crisp contrast of the door and the clean lines of the stairway and railings. Something as simple as a fresh coat of paint and a new rug can make an entry feel fresh. This induction cooktop is very unique because it has a fully usable cooking surface. Basically, put a pan or pot anywhere and the cooktop will detect it and heat only that pan or pot allowing a lot of flexibility in placement. Less high tech, but very useful is the hinge switch for the pantry light. Open the pantry door and the light comes on, close the door and the light goes off. This is the one light in the house that won’t be left on! Can the light be turned off if you want to keep the pantry doors open? Yes, if for some reason you need to air out your pantry, the light can be turned off while the doors remain open. Not at all technical, but electrical, the final detail that’s a favorite in this kitchen is the matching outlet and plate in the island. The island itself if a great color, which would have looked crummy with a standard white, almond or black switch plate. While more costly, it’s possible to get outlets and covers that match a variety of finishes. The picture looks a bit off, but in person, the outlet and cover are very similar to the island finish. This shower stands out because it blends traditional (marble), modern (glass tile) and industrial (fixtures) materials that work well together due to their cohesive color and simplicity. Speaking of color, gold is making a comeback in fixture finishes, but not the bright brass from the past. New gold is much more subdued and stylish making the fixtures in this shower, called Luxe Gold, truly look luxe. What I love about this bathroom is that it’s light, bright and open. Because it’s simple, you’re able to focus on the shape of the fixtures and finishes, which are updated, but consistent with the age and style of the home. Because everything is neutral, it’s really easy to change accessories to give the space a seasonal or fresh look. The mix of materials – stacked stone, linear tile and limestone – used to update this fireplace really appeals to me. In addition to the mixture of materials, I love a really deep hearth that’s substantial enough to sit on, and this hearth was raised and deepened to make it more comfortable. Also unique to this fireplace is the driftwood and rock log set, which is a bit more interesting than a standard log set. Finally, this loosely gathered light fixtures really take this fireplace up a notch and adds a bit of fun that ties in with surrounding accents. Shower niches can serve as design elements, but they can also harbor clutter, like empty shampoo bottles etc. The niche placement in this large shower is unique because it’s not visible from the rest of the space so it can be loaded with as many mis-matched products and potions as a bather could need and no one will be the wiser. Counter clutter can also be tucked away in the countertop tower smartly designed between the sinks and easily accessible by both homeowners. Countertop towers provide a tremendous amount of storage, the only challenge being who gets which shelf. You never know when a detail or design element will ignite your desire to remodel. When you’re ready to transform your home, let the design experts at Red House Remodeling guide you through the process. Contact us for a free consultation or register for one of our free Kitchen & Bath Remodeling Seminars.